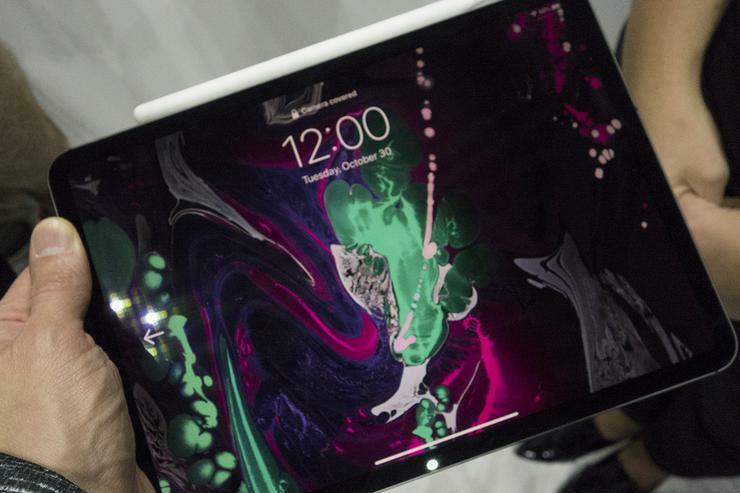 Meet the iPhone XS of tablets. Apple on Tuesday revealed the new iPad Pro, and after the presentation, I got to see the new device up close. Without the Apple logo on the back, the new iPad Pro might be mistaken for a really good iPad competitor. Maybe a Chrome tablet or a Galaxy Tab S. But definitely not an iPad and possibly not even an Apple product. Even when I picked it up, it still didn’t seem quite as familiar as the iPad. 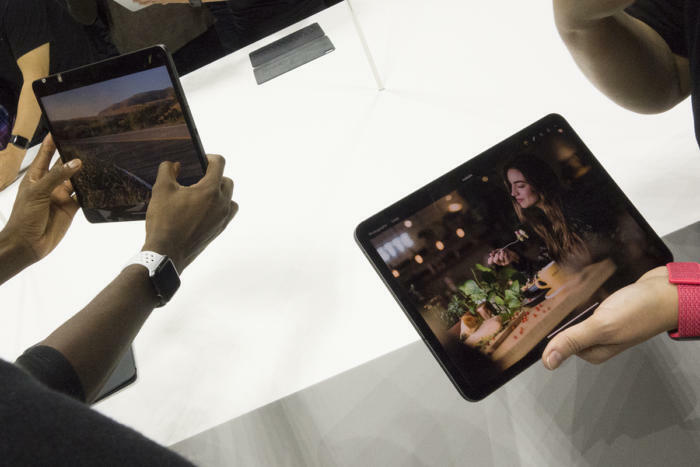 Yes, it’s built well and is as startlingly light and comfortable to hold as the iPad has always been, but there’s a whole new design language here that has more in line with the first iPad than the most recent models. That’s not a criticism. It’s just... different. Based on the Apple logo, however, it’s still a portrait-first device. The biggest change is how the back meets the sides. 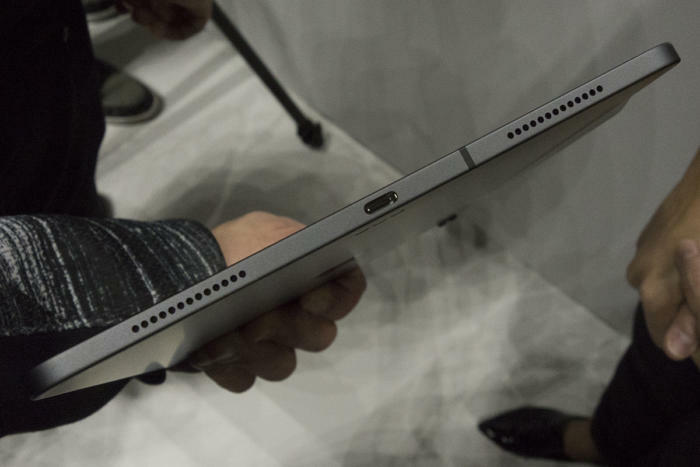 Like the original iPad, there’s no taper at the edges, so you can feel every bit of its 5.9mm thickness. It’s not even curved like the iPhone XS. The new iPad Pro is still very thin, but without the slight taper at the edges, they don’t feel quite as unbelievable as prior models. It’s an illusion, of course, as the new models are even thinner than the 9.7-inch iPad, but when I first picked it up, it didn’t have that familiar iPad feel. Nor does it really look like one. I like the design, but it’s definitely a shift for the iPad. As expected, the bezels have been minimized enough so the camera barely fits, and for the first time there’s a 360-degree symmetry with the iPad with no discernible “proper” way to hold it. That’s a first for an Apple product and it’s a tad disconcerting. I paused for a brief moment before grabbing it as my brain tried to parse the way I should rotate it in my hands. It’s something I’ll likely get used to very quickly, but after being taught the correct way to hold technology my whole life, the new iPad Pro’s pick-me-up-however-you-want design makes my head hurt. To that point, the accelerometer and Face ID camera’s visibility makes it so it literally doesn’t matter which way you hold it. And hold it you will. The smaller bezels and decreased weight make it so that even the 12.9-inch iPad Pro is much easier to hold for long stretches of time, and it’s here where the agnostic nature of the iPad’s design makes a big difference. With the old model, I always had to be conscious of where the home button was, and as such it affected the way I held it, creating undue strain on my fingers and muscles. After a few seconds I found a natural and comfortable position for my hands and could see myself holding the iPad—even the 12.9-inch one—throughout an entire presentation without needing to put it down. The 12.9-inch iPad Pro (right) looks incredible small compared to the older model. The size helps in that regard too, particularly with the larger model. On more than one occasion I thought the 12.9-inch model was the 11-inch one from a few inches away, and it was only when I saw the two devices side by side that I realized how much bigger the 12.9-inch model actually is. Both models feel remarkable smaller than the old iPad Pro due to both physical dimensions and optics, not unlike how the iPhone X feels so small compared to the iPhone 8 Plus. Like the iPhone X, the display takes up the whole front of the iPad with the same “Liquid Retina” LCD as in the iPhone XR. You’ll get ProMotion and True Tone, and even in a hands-on area with harsh overhead lighting and lengthy shadows, the screen looked as bright and crisp as it does on the iPhone XR. 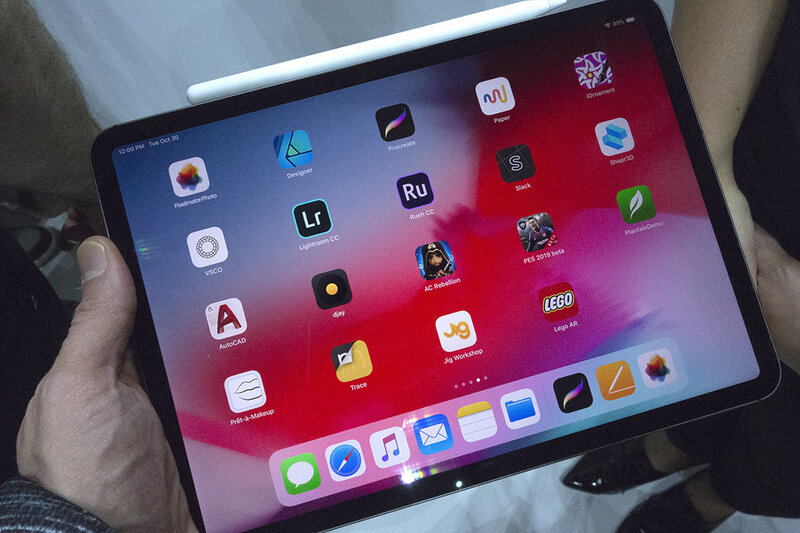 It’s going to be a long while before we see an OLED display at this size, but until that day arrives, the LCDs on the iPads Pro are the next best thing. The biggest internal change to the iPad Pro is the switch from Lightning to USB-C. That means you can hook up peripheral devices just like you would yo your Mac, including a 5K monitor. An Apple rep told me that it has to be DisplayPort though, so USB-C to HDMI won’t work. 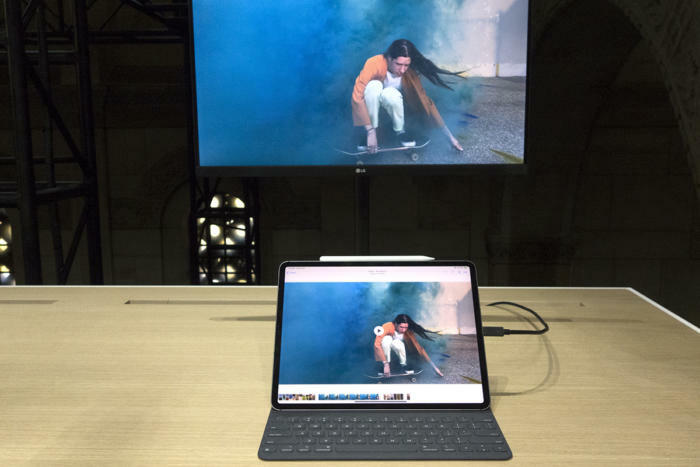 You can hook up a 5K monitor to the iPad Pro via USB-C.
Apple is also selling a new Pencil to go with the iPad Pro that can now attach to the top of your iPad (or side, depending on how you’re holding it), so you’re less likely to lose it. And since it charges as soon as it’s attached, you won’t have to worry about losing power or breaking it when it’s sticking out of the Lightning port. It’s not strong to the point where it won’t get knocked loose in a bag, but it’s definitely good enough to rest while you’re holding it. That same flat magnetic edge has a touch-sensitive area for switching tools while drawing—which is probably more gimmicky than useful—and the flat edge is noticeable when holding it, but in a good way, like a sketching pencil. 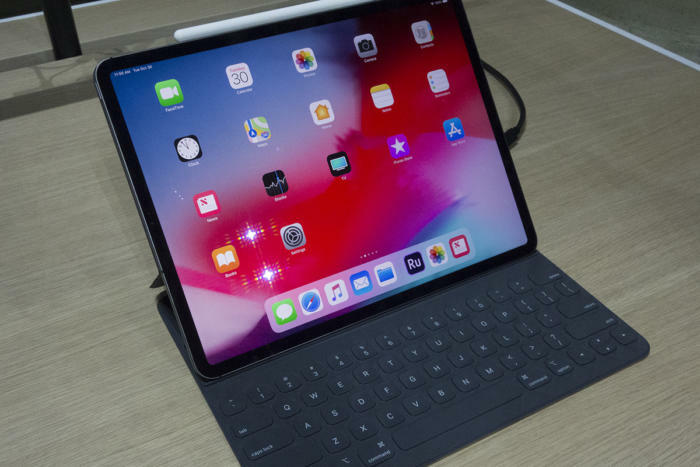 The Smart Keyboard has been redesigned for the new iPad Pro as well, and it has an extra adjustment angle for working or watching movies. It feels exactly the same as the old model when typing, but it’s thinner when closed. And since there are magnets everywhere, it doesn’t matter which end of your iPad is up when you pop it into the holder. There’s a new 12-megapixel camera on the rear of the iPad Pro with a fairly aggressive camera bump, but the bigger change is to the front camera. Apple has fitted the new iPad Pro with the iPhone X’s TrueDepth camera for Face ID unlocking, Animoji, and Portrait selfies. Apple is selling a new Smart Keyboard for the new iPad Pro. It’s still positioned on the top portrait edge of the screen, but Face ID works in either direction. I wasn’t allowed to set up my own, but when I held it for the Apple rep whose face was registered, it unlocked quickly at any angle. One thing though—without a home button, I inadvertently put my thumb over the lens when shifting it to landscape mode. However, the system was smart enough to tell me to move my finger. Face ID might have been an expected feature, but it’s probably the most important feature in the new iPad. Without it, the new design would never have been possible. Face ID gives Apple an unlocking method that’s as secure as a fingerprint sensor without taking up nearly as much room. Tim Cook said the new iPad Pro is the model Apple always wanted to make, and Face ID is the thing that makes it possible. No, that’s not Lightning, it’s USB-C.
Also inside the iPad is an A12X processor, up to 1TB of storage, four speakers, five microphones, and a battery that, as has been the case since the first model in 2010, lasts “up to 10 hours.” It’s nice to know that some things never change.